I’ve been an obsessive keeper of notes for my entire adult life. How do I keep all of this information straight? I use a great tool called Evernote. 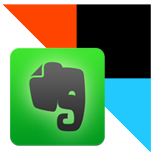 Evernote organizes notes in notebooks and has a robust tagging feature. What’s great is it synchs across its very nice desktop, web, and mobile apps, so I have access to my info no matter where I need it. First there was the paper-based notebook system: In the ’80s and earliest ’90s I used a binder with pre-printed inserts. In addition to the usual calendar and contacts, I kept notes with the addresses and hours of my favorite restaurants, the PMS #s for the colors of my clients’ logos, conversion tables and formulas, lists of European and US paper sizes, and so very much more. I still have a big box of beloved “DayTimer supplies” in my office that I can’t bear to get rid of even though I’ll never use them again. Then there was the PalmPilot: In the ’90s I entered all of my information into my PalmPilot, transferring the data over every time I upgraded to a new device. (Stop and marvel at this a moment: I input all of that information using the PalmPilot “graffiti” input method!). But eventually the PalmPilot fell out of favor and then fell to the wayside, and I reverted to a hodge-podge of notes spread across folders in my computer, my Outlook drafts folder, and some paper-based notes… it was a mess. 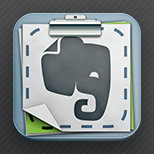 Evernote uses a notebook theme just as OneNote does, but it is extremely flexible. Evernote ditches the very pretty look of a notebook that OneNote uses in exchange for a clean, fluid, flexible interface that simply does not get in your way. Without the skeuomorphic association of a real-world notebook it took me a day to get used to it, but after a weekend with it I was completely sold. 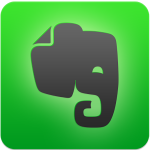 Evernote is available for Mac, Windows, Android, IOS, Windows mobile devices, and on the web. The Free account is suitable for almost everybody, however I signed up for their midlevel paid service because I also use Evernote extensively for all my work stuff and share notebooks with multiple clients. The Evernote website provides a fantastic wealth of documentation to get you started so I’m not going to bother to try to duplicate that here. Head over to the Evernote support page or their very informative blog and I doubt you’ll leave with any questions unanswered. So, beyond the basics that you can cover with the above links, here are four features that provide more reasons why I love Evernote. 1. Web Clipper. If you install the Evernote WebClipper addon to your web browser, then when you are viewing web content you like, you can hit your Evernote button, select a notebook, and it will add it to your Evernote (and keep a reference to where it came from). Unless you tell it not to, it will strip out the extraneous web template stuff and only save the main content (which 99% of the time is exactly what I want it to do). 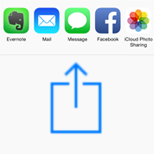 Here is where you can download the WebClipper for your browser, and head over to the Evernote WebClipper page for more information. 3. IFTTT automation. There is a fantastic automation tool out in the interwebs called IFTTT, which means “If This Then That.” There are others as well, one of which is Zapier, but I haven’t tested this with them. I set up my IFTTT account, attached my blog and my Evernote accounts to it, then every time I publish a new blog post, it automatically puts a backup copy into my Evernote. I did the same thing with my twitter account. Here’s a LifeHacker post that goes into more detail about this. 4. Email to Evernote. Did someone email you some handy info? Forward it to your Evernote account by using your special Evernote email address. To find your Evernote email address, log into your Evernote account online, go to your Account Summary, and look near the bottom of the page. You can also share this email address if you want to trust others to email into your account (this will not let them otherwise access your account!). If you need to, you can reset the email address on the same Account Summary page. 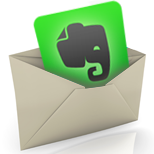 Here’s an Evernote Blog article about the email feature. Once you start getting all your notes into Evernote, you’ll quickly see that it’s good to figure out a method to your madness. A big pile o’ notes is a mess. A big pile of notes that are organized in a well-planned way is an organization system! Rather than recreate the wheel, here are some very good posts on planning on how you should organize the notebooks, notes, and tags in your Evernote. Having all kinds of great information is only worthwhile if it is at your fingertips and is easy to retrieve. Evernote’s ubiquity, non-intrusive interface, and ease of ease make it an excellent organization choice.